Meigs defenders Alyssa Smith (20) and Olivia Haggy trap River Valley’s Sierra Somerville during the second half of Monday night’s girls basketball contest at Larry R. Morrison Gymnasium in Rocksprings, Ohio. River Valley freshman Lauren Twyman (20) dribbles past Meigs defender Jerrica Smith during the second half of Monday night’s girls basketball contest at Larry R. Morrison Gymnasium in Rocksprings, Ohio. ROCKSPRINGS, Ohio — No championship, but defense still managed to win this one. 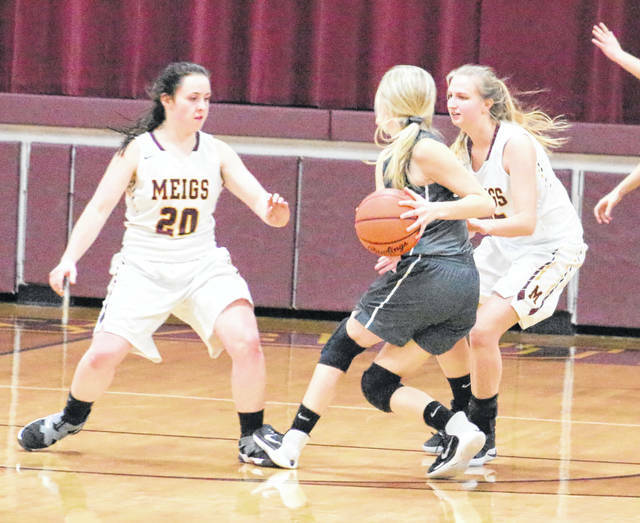 The Meigs girls basketball team forced 23 turnovers and held visiting River Valley to 27 percent shooting on Monday night while rolling to a 56-25 Tri-Valley Conference Ohio Division victory at Larry R. Morrison Gymnasium in Meigs County. The Lady Marauders (11-8, 5-5 TVC Ohio) found themselves in an early 2-0 hole a minute into regulation and were knotted up at five-all with just over three minutes left in the opening canto, but the hosts countered with seven unanswered points over the final 3:08 to secure a 12-5 advantage through eight minutes of play. The Lady Raiders (5-15, 0-10) were never closer the rest of the way as the Silver and Black had more turnovers (six) than shot attempts (five) in the second frame, and Meigs netted five trifectas as part of an 18-9 surge that gave the Maroon and Gold a sizable 30-14 edge entering the break. River Valley committed another seven turnovers in the third frame as the Lady Marauders used those extra chances to make a 15-4 charge that extended the lead out to 45-18, then claimed their largest lead of the night when Taylor Swartz made a basket for a 54-21 cushion with 4:05 left in regulation. The Lady Raiders went on a small 4-2 spurt over the final 2:51 to wrap up the 31-point outcome. 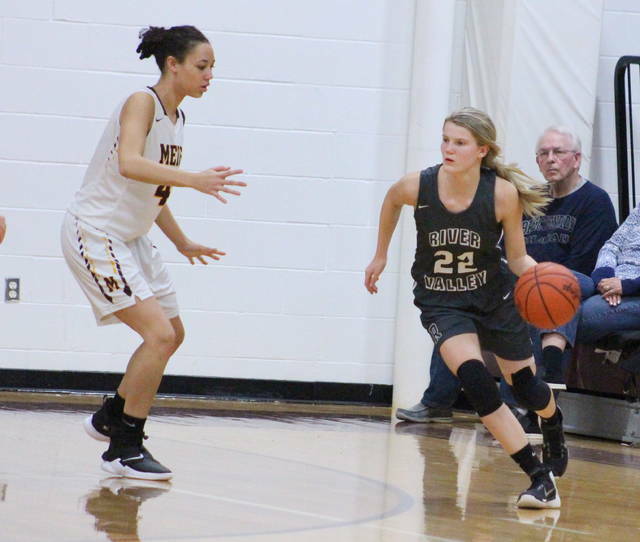 Meigs also claimed a season sweep of the Silver and Black after posting a 55-23 in Bidwell back on Dec. 13, 2018. 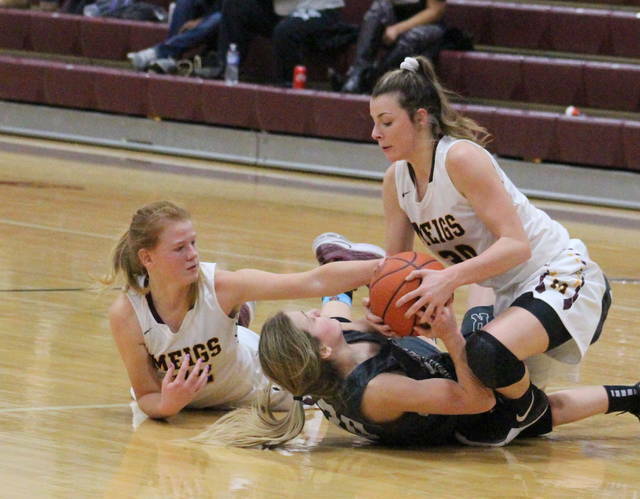 The turnover differential was 13-5 in the middle quarters, which allowed Meigs to make a 33-13 surge while turning a seven-point lead into a 27-point edge. The Lady Marauders also netted 11-of-28 shot attempts during that span, including a 6-of-16 effort from behind the arc. Given that his team had some early offensive struggles, MHS coach Jarrod Kasun noted that the defensive effort helped keep Meigs in contention. Then, when shots started to fall, the defense just improved that much more. And, as the third-year mentor commented afterward, the Lady Marauders are a much bigger threat to opponents when their offense is clicking. The Lady Marauders committed four of the 10 turnovers in the opening canto and went just 4-of-13 from the floor before a Becca Pullins 3-pointer went in just before the buzzer, allowing the Maroon and Gold to take a seven-point cushion. Madison Fields gave MHS its first double-digit lead with a trifecta 55 seconds into the second period, and the Lady Raiders were never closer than 19-10 following a Hannah Jacks basket with 4:20 remaining. The Lady Marauders followed with three 3-pointers as part of an 11-2 run that resulted in their biggest lead of the first half at 30-12 with 37 seconds left. Jacks added a bucket with a dozen seconds remaining to make it a 30-14 contest at the intermission. The Silver and Black went 5-of-15 from the field in the first half and also committed a dozen turnovers. The guests were outrebounded 6-2 on the offensive glass, but both teams hauled in 12 total caroms apiece. Meigs, on the other hand, went 10-of-24 from the floor and had just a half-dozen miscues. RVHS coach Stephen Roderick acknowledged afterwards that early mistakes cost his troops, even though they were prepared for what was coming. The third-year mentor, however, did note his appreciation for his club’s effort … and the overall performance by his opponents. “Meigs did what we thought they’d do and they pressured us. They were definitely ready to play,” Roderick said. “We didn’t do a very good job of handling that pressure early on, but I’m proud that the girls kept playing hard and played it out. The Lady Marauders led by as many as 30 points (45-15) in the third frame, and the guests mustered their only field goal of third quarter with 40 seconds left in the stanza. That basket, coincidentally, sparked a 3-0 run for a 45-18 contest headed into the finale. Kelsey Brown converted the opening bucket of the fourth 15 seconds in, but the Silver and Black were never closer down the stretch. Meigs followed with a 9-1 surge that resulted in a 33-point lead with 4:05 remaining. The hosts outrebounded RVHS by a 31-26 overall margin, including a 13-3 difference on the offensive glass. Meigs also committed 11 turnovers in the triumph. The Lady Marauders connected on 21-of-56 field goal attempts for 38 percent, including a 9-of-31 effort from behind the arc for 29 percent. MHS was also 5-of-7 at the free throw line for 71 percent. Kassidy Betzing paced the Maroon and Gold with a game-high 16 points, followed by Fields with 10 points. Hawley and Pullins were next with nine markers each, while Alyssa Smith chipped in eight points. Swartz and Jerrica Smith completed the winning tally with two points apiece. Fields and Hawley led the hosts with six rebounds each, with Swartz and Alyssa Smith hauling in five apiece. River Valley went just 8-of-30 overall from the floor, including misses on eight of its 3-point tries. The guests were also 9-of-21 at the charity stripe for 43 percent. Brown paced the Lady Raiders with eight points, followed by Jacks with seven points and a game-high nine rebounds. Kaylee Gillman was next with three points, while Lexi Stout, Beth Gillman and Sierra Somerville each contributed two points. Cierra Roberts completed the River Valley scoring with a single point. Brown and Kaylee Gillman also grabbed four and three caroms, respectively. 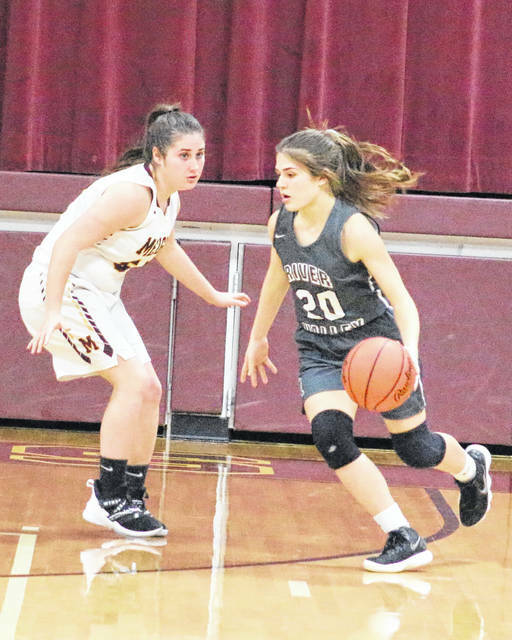 Meigs returns to action Thursday when it hosts Wellston in a TVC Ohio matchup at 6 p.m.
River Valley traveled to Point Pleasant on Tuesday night and returns to action Monday when it travels to McArthur for a TVC Ohio contest against Vinton County at 6 p.m.